I'm going all out this month with cooking and baking I will be sharing my recipes with you and letting you know just how or not so tasty they are after I have tried them. I combined in a bowl, 1/2 teaspoon of cinnamon, 1/2 teaspoon of ground ginger, 1/2 teaspoon of ground white pepper and 1/4 teaspoon of ground cloves. I mixed them together then took a teaspoon of the mixed spices and placed this inside the duck. I then added 1 tablespoon of light soy sauce to the rest of the spice mixture and rubbed this all over the duck making sure it was very well covered. I left it in the fridge over night so all the flavours could sink into the meat. I felt very chef like doing all this and the combination of spices smelt lovely. 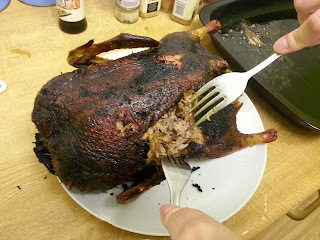 After leaving the duck overnight to marinate it was almost ready to start cooking. I cut some spring onions up and placed them inside the duck. Then into the oven it went (gas mark 5/ 190C) I left the duck for about an hour then removed it to coat it in a mix of 2 tablespoons of light soy sauce and 1 tablespoon of honey. The duck was returned to the oven for another 2 hours. This is my duck once it was ready. I served the duck in wraps with egg fried rice. To my surprise it was actually really nice, I thought that I would over cook the duck and make it dry. The duck was nearly perfect. I didn't realise until I was shredding the duck how little meat you get on them. You can see the size of ours in the above picture and there was enough there for Liam and me to have two duck wraps each. Unfortunately I don't have any more pictures as my battery went on my phone after taking this one. If you would like to make this then please make sure you cook for the recommended time stated on the packaging of you purchased duck.